The quadriceps tendon works with the muscles in the front of your thigh — the quadriceps — to straighten your leg. Although anyone can injure the quadriceps tendon, tears are more common among middle-aged people who play running or jumping sports. A complete tear of the quadriceps tendon is a disabling injury. It usually requires surgery to regain full knee function. 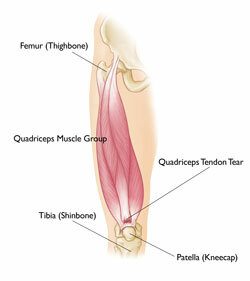 The four quadriceps muscles meet just above the kneecap (patella) to form the quadriceps tendon. Tendons attach muscles to bones. The quadriceps tendon attaches the quadriceps muscles to the patella. The patella is attached to the shinbone (tibia) by its tendon, the patellar tendon. Working together, the quadriceps muscles, quadriceps tendon and patellar tendon straighten the knee. 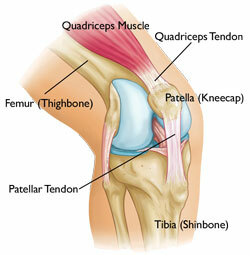 Quadriceps tendon tears can be either partial or complete. Partial tears. Many tears do not completely disrupt the soft tissue. This is similar to a rope stretched so far that some of the fibers are torn, but the rope is still in one piece. Complete tears. A complete tear will split the soft tissue into two pieces. When the quadriceps tendon completely tears, the muscle is no longer anchored to the kneecap. Without this attachment, the knee cannot straighten when the quadriceps muscles contract. A quadriceps tear often occurs when there is a heavy load on the leg with the foot planted and the knee partially bent. Think of an awkward landing from a jump while playing basketball. The force of the landing is too much for the tendon and it tears. Tears can also be caused by falls, direct force to the front of the knee, and lacerations (cuts). A weakened quadriceps tendon is more likely to tear. Several things can lead to tendon weakness. Tendonitis. Inflammation of the quadriceps tendon, called quadriceps tendonitis, weakens the tendon. It may also cause small tears. Quadriceps tendonitis is most common in people who run and participate in sports that involve jumping. Steroid use. Using corticosteroids has been linked to increased muscle and tendon weakness. Fluoroquinolones. This special type of antibiotic has been associated with quadriceps tendon tears. Immobilization. When you are off your feet for a prolonged period of time, the muscles and tendons supporting your knees lose strength and flexibility. Although it is rare, quadriceps tears have occurred after a knee surgery or dislocation. > Have you had a previous injury to the front of your knee? > Have you ever injured a quadriceps muscle? > Do you have quadriceps tendonitis? > Do you have any medical conditions that might predispose you to a quadriceps injury? To determine the exact cause of your symptoms, your doctor will test how well you can extend, or straighten, your knee. While this part of the examination can be painful, it is important to identify a quadriceps tendon tear. X-rays. 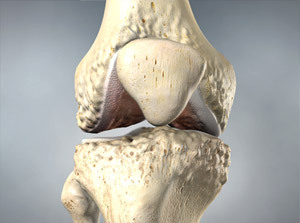 The kneecap moves out of place when the quadriceps tendon tears. This is often very obvious on a “sideways” X-ray view of the knee. Complete tears can often be identified with these X-rays alone. MRI. This scan creates better images of soft tissues like the quadriceps tendon. The MRI can show the amount of tendon torn and the location of the tear. Sometimes, an MRI is required to rule out a different injury that has similar symptoms. If you have been diagnosed with a quadriceps tendon tear, you should go to an orthopaedic surgeon for treatment. Most small, partial tears respond well to nonsurgical treatment. Exercises will gradually be added to your program. Straight leg raises to strengthen your quadriceps are often central to a physical therapy plan. As time goes on, your doctor or therapist will unlock your brace. This will allow you to move more freely with a greater range of motion. You will be prescribed more strengthening exercises as you heal. Your doctor will discuss with you when it is safe to return to sports activity. Depending on your age, your activities, and your previous level of function, your doctor may recommend surgery for a large partial tear or a partial tear with associated tendon degeneration. Your surgeon will go over all the information and discuss an individualized plan for you. Most people with complete tears will require urgent surgery to repair the torn tendon. Surgery is also an option for people with partial tears who also have tendon weakness and degeneration. 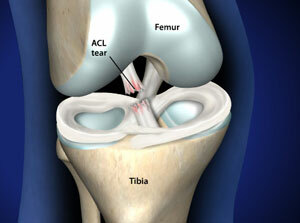 Surgical repair reattaches the torn tendon to the top of the kneecap. People who require surgery do better if the repair is performed early after the injury. Early repair may prevent the tendon from scarring and tightening in a shortened position. Hospital stay. Tendon repairs are sometimes done on an outpatient basis. Most people do stay in the hospital at least one night after this operation. Whether or not you will need to stay overnight will depend on your medical needs. The surgery may be performed with regional (spinal) anesthetic or with a general anesthetic (breathing tube). It cannot be done under local anesthesia. Procedure. To reattach the tendon, sutures are placed in the tendon and then threaded through drill holes in the kneecap. The sutures are tied at the bottom of the kneecap.Your surgeon will carefully tie the sutures to get the right tension in the tendon. This will also make sure the position of the kneecap closely matches that of your uninjured kneecap. New Technique. A recent development in quadriceps tendon repair is the use of suture anchors. Surgeons use anchors to sew the tendon to the top of the kneecap. Using these anchors means that drill holes in the kneecap are not necessary. This is a new technique, so data is still being collected on its effectiveness. Most orthopaedic research on quadricep tendon repair involves the direct suture repair with the drill holes in the kneecap. Considerations. Some surgeons use a wire, sutures, or cables to help hold the kneecap in position while the tendon heals. If your surgeon does this, the wires or cables may need to be removed during a later, scheduled operation. If your tendon has shortened too much, it will be hard to re-attach it to your kneecap. Your surgeon may need to add tissue to lengthen the tendon. This is often the case if more than a month has passed since your injury. Severe damage from the injury or underlying disease can also make the tendon too short. Your surgeon will discuss this additional procedure with you prior to surgery. Complications. The most common complications of quadriceps tendon repair include weakness and loss of motion. In addition, the position of your kneecap may be different after surgery. Rehabilitation. After surgery you will require some type of pain management, including ice and medications. About 2 weeks after surgery, your skin sutures or staples will be removed in the surgeon’s office. Most likely, your repair will be protected with a knee immobilizer or a long leg cast. You may be allowed to put your weight on your leg with the use of a brace and crutches (or a walker). Over time, your doctor or therapist will unlock your brace. This will allow you to move more freely with a greater range of motion. Strengthening exercises will be added to your rehabilitation plan. In some cases, an “immediate motion” protocol (treatment plan) is prescribed. This is a more aggressive approach and not appropriate for all patients. Most surgeons protect motion early on after surgery. Complete recovery takes at least 4 months. Most repairs are nearly healed in 6 months. Many patients have reported that they required 12 months before they reached all their goals. Most people are able to return to their previous occupations. Slightly over half of people have thigh weakness and soreness at the site of the tear. People who require surgery do better if the repair is performed early after the injury. If you are a competitive athlete, your surgeon will most likely want to test your leg strength before giving a go-ahead to return to sports. Your surgeon will compare your leg strength using some functional knee testing (like hopping). The goal is that your strength be at least 85-90% of your uninjured side. In addition to leg strength, your surgeon will assess your leg’s endurance, your balance, and if you are having any swelling.